Christian translator of Benjamin of Tudela's travels; born at Schwabach, Bavaria, in 1721; died in 1740. He was only thirteen years old when he published his first work, "Voyages de Rabbi Benjamin Fils de Jona de Tudèle. Traduits de l'Hébreu et Enrichi de Notes et de Dissertations Historiques et Critiques sur ces Voyages, par J. P. Baratier, Etudiant en Théologie. A Amsterdam, aux Dépens de la Compagnie," 1734. It is difficult to believe that the translation in two large volumes is the work of a child of eleven; but the preface, dated Schwabach near Nuremberg, 1733, contains an affirmation of the fact by a modest pastor of the Reformed Church, who knew Hebrew and called himself the sole preceptor that Jean had yet had. 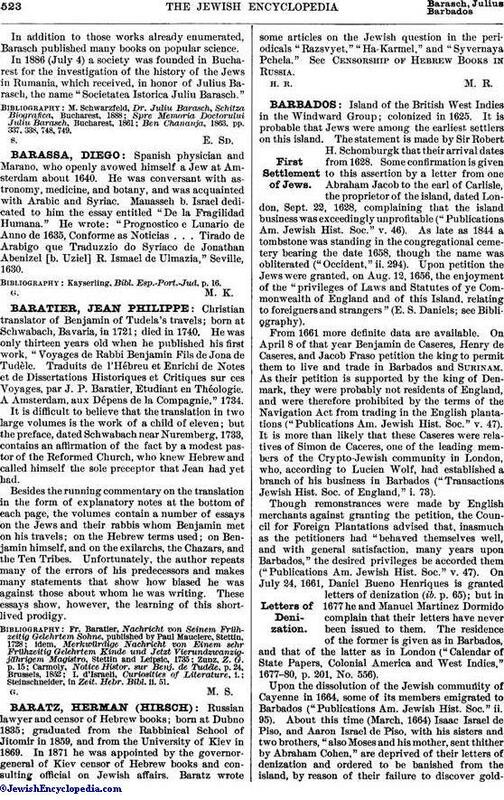 Besides the running commentary on the translation in the form of explanatory notes at the bottom of each page, the volumes contain a number of essays on the Jews and their rabbis whom Benjamin met on his travels; on the Hebrew terms used; on Benjamin himself, and on the exilarchs, the Chazars, and the Ten Tribes. Unfortunately, the author repeats many of the errors of his predecessors and makes many statements that show how biased he was against those about whom he was writing. These essays show, however, the learning of this shortlived prodigy. Steinschneider, in Zeit. Hebr. Bibl. ii. 51.